Nature is a beautiful thing, But not always…. FLORIDA | A man was taking a peaceful stroll on a nature reserve in Lakeland, and was drinking in all the beautiful scenery and wildlife. Then, he saw a massive cannibal alligator chomping on another gator. He, of course, decided to film the harrowing spectacle and put it on YouTube. 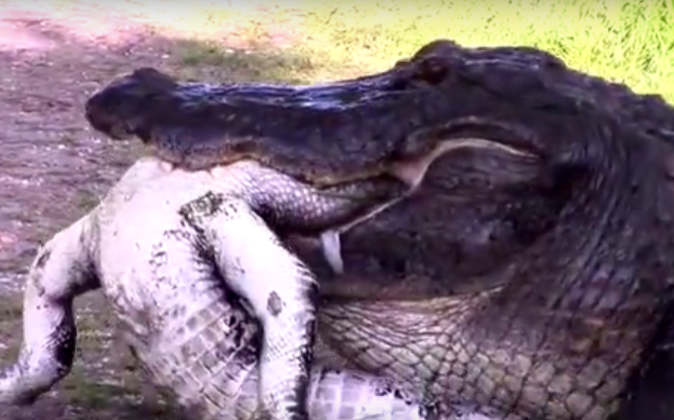 Alligators may use cannibalism in order to control their population. He said the alligator was around 11 or 12 foot long, and the one clamped between his jaws was significantly smaller.